How to organise your Danube cycling holidays? Making it to this page, you are obviously more than interested in cycling the Danube. While you can always book a package holiday (self-guided and guided tours are available), you are able to organise the trip all by yourself. By doing so you have a good chance to save some money. You certainly have more control over the itinerary: Where to stay and what distance to cover every day. Travel to Munich the way you like it. Rent a bicycle in Munich. We recommend getting a "Trekkingrad 27-speed" from bikebringer.de. You can pick up the bicycle from a bike shop nearby underground railway station Thalkirchen (Tierpark) [U3 line]. Alternatively, the bicycle gets delivered to your hotel or the main train station for a small service fee (between €10 and €20). Make sure to reserve your bicycle early if you intend to cycle during peak season. Don't forget to mention your height or preferred frame size as well as our website when contacting Steffen from bikebringer.de. Thank you! 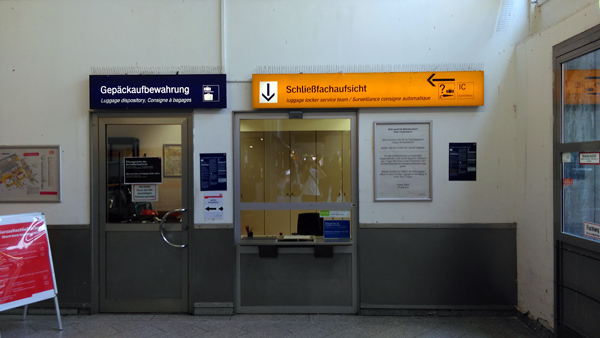 Have your belongings in panniers already or leave your suitcase(s) with your hotel in Munich for the time traveling. Another option for storing your luggage in Munich long-term is offered by Stasher.com. You arrived at the cycle path. Hooray! There are up to 570 miles of Danube cycle path ahead of you (from Donaueschingen/source to Vienna). The blue guide books from Esterbauer Verlag provide excellent maps of the cycle paths. End your cycling holidays in Linz or Vienna, or anywhere before. When finishing inAustria, take a RailJet train back to Munich (departing every two hours). You may want to consider getting a train-specific ticket well in advance and save money. Either way, reserve a place for your bicycle and get a "Biking International Ticket" for your bicycle. In case you decided to finish cycling somewhere in Germany (for example: Passau), take a Deutsche Bahn train back to Munich. Back in Munich, take the bicycle to the rental service, pick up your luggage and get back home relaxed and with lots of impressions in mind. Feel free sharing your experience with us. We are always happy to put your input on the website to make cycling the Danube easier for everyone and even more relaxing. Taking a bicycle on the underground train in Munich is generally allowed, except during rush hours: Mon-Fri 6-9 am and 4-6 pm (source). You need a bicycle day ticket which you get at the vending machines (currently €3). Travel to Vienna the way you like, for example by air or by train. Rent a bicycle in Vienna. You find an overview over rental stations on our website. Some services even deliver the bicycle to your hotel in Vienna. Either use your own set of panniers from home or rent a pair with the bicycle. You arrived on the cycle path. Perfect! Now either start cycling the Danube immediately or take the remaining day off and discover the place before kicking it the next morning. The blue guide books from Esterbauer Verlag provide detailed maps of the cycle paths. Lists of recommended hotels along the cycle path can be found on our website (German Danube hotels, Austrian Danube hotel). In Vienna, the cycle path will lead you right into the city centre. There are proper cycle paths that follow the Danube canal ("Donaukanal") passing the central, 1st district ("1. Bezirk"). Of course, if you like, cycle on downstream and take a return train to Vienna, for example from Bratislava (Slovakia) or Budapest (Hungary). Back in Vienna, return the bicycle, pick up your luggage and celebrate your achievement. 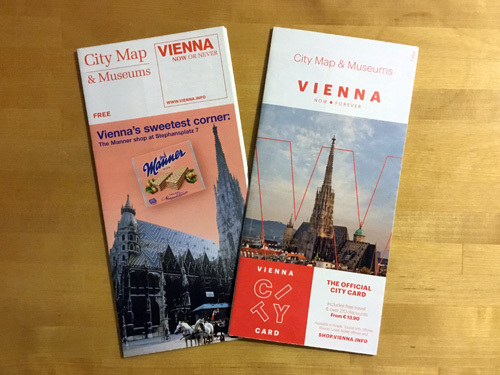 On your first day in Vienna, pick up a free city map from any hotel on your way. You will find the city maps often presented somewhere in the lobby or near the front desk, next to all sort of advertising flyers. The map will help you finding your way when entering Vienna by bicycle, and when cycling to the train station. By the way: The maps are available in various languages! Enjoy cycling up and down the Valley, about 36 km one-way. There are cycle paths on both sides of the river! To shorten your ride, take one of the ferries across the river: in Dürnstein/Rossatz, in Weißenkirchen/St. Lorenz, in Spitz/Arnsdorf - or take the same way back. You will love it anyway! Furthermore, there are also several ferries going along the Valley. Bring a cycle path map or at least an app with downloaded map information (e.g. MAPS.ME). If you rent a bicycle locally and use your panniers from home, make sure your panniers fit to the rental bicycle's carrier. To be on the safe side, ask the rental service for the carrier's horizontal tube diameter in advance. It is usually between 8 and 12 mm. 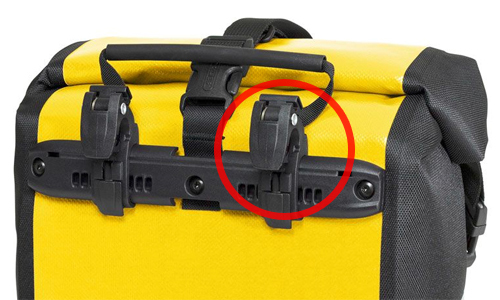 If you got panniers from Ortlieb or Vaude, they come with inserts that bridge the gap to thinner tubes. If you can't remember where you stored your inserts, duck tape around the carrier's tube will do as well.